I want to talk about this little book. This little 52 page book I bought off Amazon for £3. This little book has summed up all my feelings, issues and rants about the big things wrong with the world at the moment. 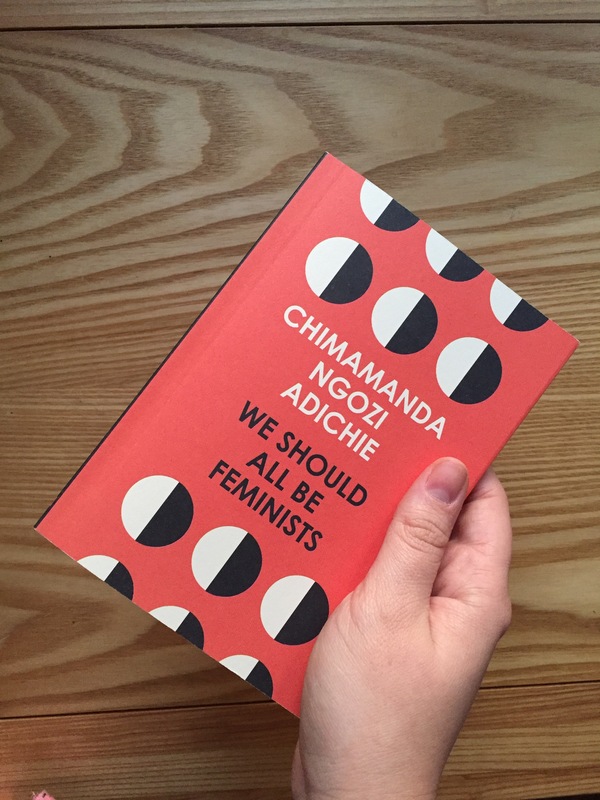 We Should All Be Feminists is a personal, honest and clarifying essay which may be read and appreciated regardless of your education or social class. We Should All Be Feminists acts within any box you could be put into socially or economically, whatever your culture or religion. And that’s the beauty of it. It is a call for equality where no one can hide from it. The big issues which really stood out for me was the question of defining feminism. The stereotypes and baggage that title claims is rooted to the soul reason why we need it. Feminist: a person who believes in the social, political and economic equality of the sexes. “A Nigerian acquaintance once asked me if I was worried that men would be intimidated by me. Even more so, teach it! This book originates from the TEDtalks organisation. The talk is 3 0 M I N U T E S L O N G. That gives time for discussion after the lesson! A good 30 minutes more of hearing what people think and feel about a concept which is so greatly shaping our growing culture. Let’s have a debate. Let’s discuss other feminist talks, literature. Start asking questions! Are there any male feminist writers? Research them. Let’s learn about some cultural catalysts which are right under our noses. Share. Encourage young people to offer up ways in which they may relate to the issues raised in the talk. Spark confidence in those who never knew they had it. From the moment I finished this book, essay, thing I’ve told my best friend. My aunt. I posted a quote on Snapchat and a vague distant friend sent me a message saying “WHAT BOOK IS THIS? I NEED IT!” I watched the TEDtalk and loved it even more. So please go and watch it. Be enlightened. Enjoy having your mind blown a little. The link is below as well as my favourite extracts. A book stolen (not literally) from a charity shop; beaten and worn; its previous owner of whom wrote on the first page Judith, second name illegible, the date 1995; years before I was even born. To sum it up; me and this bad boy were going to have some fun. I love a bit of Orwell; having read both 1984 and Animal Farm; in that order. I’ve been dying to get my hands on this one; not really being sufficiently within the funds to buy a brand new one from Waterstone’s, this charity shop treat was the perfect excuse to simply convince and assure myself ‘I definitely need this one’; never mind the fifty books yet to be opened. Having never really read into Orwell and the context in which he wrote in; him being an Etonian came of a bit of a shock to me as well as the fact of Eton’s education system dismissing English Literature as a simple pastime, not something to be taught back in the day: oh how the other half live! It also makes me wonder what form Orwell‘s writing would have taken if he had have been able to pursue it at school. Would he be the much loved and adored author we know? Or just Eric? On to the book, then. Knowing Orwell‘s schooling; it came as a great surprise to see and wonder just how on earth this probably well-off man, managed himself in the immense poverty in which he immersed himself into quite willingly; if not forcefully. His writing speaks volumes also on what he shied away from; anything luxurious or had worth to it. He drowned in the working class society of Paris; yet his writing was not solemn and self-pitying, but full of pride and an air of snobbishness which he seemingly tried to cover up. It is almost as if he loves it; he loves the poverty and having nothing. Or is he simply able to live and experience it without the prejudice as he is able to have a hand on the safety button and escape from it all; his peers and family happy with that decision. So as much as he tries to kid himself throughout this type of memoir of poverty, I still believe that the old Etonian is very much alive in him. But don’t get me wrong it was a huge insight into that world which one can’t deny is utterly alien to our own; you don’t know poverty until you’ve read this book. These two extracts stood out at me; first for Orwell‘s utter Britishness and then for being a wise fella. There are, indeed, many things in England that make you glad to get home; bathrooms. armchairs, mint sauce, new potatoes properly cooked, brown bread, marmalade, beer made with veritable hops- they are all splendid, if you can pay for them. Then the question arises, Why are beggars despised?–for they are despised, universally. I believe it is for the simple reason that they fail to earn a decent living. In practice nobody cares whether work is useful or useless, productive or parasitic; the sole thing demanded is that it shall be profitable. In all the modem talk about energy, efficiency, social service and the rest of it, what meaning is there except ‘Get money, get it legally, and get a lot of it’? Money has become the grand test of virtue. By this test beggars fail, and for this they are despised. If one could earn even ten pounds a week at begging, it would become a respectable profession immediately. A beggar, looked at realistically, is simply a businessman, getting his living, like other businessmen, in the way that comes to hand. He has not, more than most modem people, sold his honour; he has merely made the mistake of choosing a trade at which it is impossible to grow rich. Finally, back to some normality. This book has done some traveling over its time in my possession; Norway and back, and it took me the entire two weeks to get through it and then some. As this is not a novel, it is an easy read to pick up and put back down again between the odd mundane task, picking up from another entry, possibly reading and entry a day. I confess, this was the first historical read I’ve ever invested in (blasphemy, I know), and apparently its a historic read because it said so on the back; so that’s that. The reason why it took it took so long was due to its content, the War was bleak wasn’t it? I never took history at school and my knowledge of the First World War stretches as far as Downton Abbey (blasphemy) at the best of times; I decided I needed some education on the matter. And it was shocking. It was shocking, and dreadful and painful and full of despair and love and hope and fear and the brutality of humanity. We can become the most beautiful creatures when we’re on the brink of death, destruction and any other dreary word that beings with ‘D’. I had to keep putting it down to just take a breather. As a first historical account of the Great War; I have been enlightened. I’m overwhelmed with the sense that I shouldn’t forget. This is a proper interesting one, this is! For all the med geeks out there, this one is a definite read! Recently one of Waterstones’ bestsellers (it was on one of the table thingys) this is quite a popular book at the moment and it has all its right to be. Contrasting heavily with Do No Harm, I can say, this is ten times more scientific. I skipped a few pages at some parts because I simply wasn’t interested in the content and then was able to pick up when I found something I was interested in. This felt more of a textbook with a splash of humor and mostly dry pages and a lot on ancient philosophies and so on. It doesn’t sound like I enjoyed it, does it? I did! I really did, but its dull and exactly what I would expect from a science based book. If I had read this before Do No Harm by Mr Henry Marsh, I would have bloody loved it… but I didn’t so I didn’t love it. I enjoyed it. This isn’t so much as a book; more of a taster guide to people. Humans of New York isn’t the usual type of book I would buy. It’s clunky, heavy and doesn’t really fit well with my bookcase. I started following Brandon Stanton’s page of Instagram through a friend; and was completely taken aback but the raw honest of his words. You are able to hear the voices of the people he has captured through his camera lens. And it’s beautiful. There is light and darkness, good and bad, funny and serious a cocktail of emotions and tales which are so inexplicably human. There were moments my jaw dropped and others where I smiled affectionately at the memory of a complete stranger. Brandon Stanton is able to speak volumes on his ability to listen to humans, with hardly saying a word; all through his photography and a simple conversation on the streets of New York. I love this idea! I have always wanted to try something like this but frankly don’t have the guts. I felt so incredibly human whilst reading about humans and I feel thats the aim of this collection. Breathe. I love that word; it can be so versatile; powerful and desperate; a demand, statement or plea. And if you’re stuck on a question; looking up for inspiration (bio pun 😉 ), and happen to be sitting in one of the chairs within a one desk radius of myself, you’ll notice when I come to answer this, my left hand will be pressed against my chest, my right hand against my middle and my eyes closed. Because I know if I breathe, my body will tell me the answer my brain can’t remember. Breathing is the most natural thing we can do; the first thing our body must learn to do when we are born. I have the answer; I am my own personal cheatsheet. The beauty of studying the human body is that you have a human body. Kalanithi was human; and his own body betrayed him by attacking itself. The function of breathing which was a God given right turned into a struggle; something which must have been earned by Taking Care Of Yourself and Not Pushing It Too Far Today. In this book of defiance, I became Kalanithi’s friend; and he mine. It could be considered a book of confessions of living and what it entailed to live very fully and be waiting for the peak; the peak you planned for; the car, the holiday, the leisure of finishing a task; and to be cut short of that; his mandate which he swore his life to; is infinitely unfair. A plea, demand and statement. Paul Kalanithi’s book has an impossibly, important message for the immediate population; regardless of profession. Read it because you’re human, and seeing the world from the other end of the line really puts things into perspective. Now this memoir, well… I don’t know what to think. This book really does open your mind to a world within our own that we hardly consider. It lets us into a deeper mindset that not all of us can comprehend, and I must admit I’m still have trouble coming to terms with it.But as an educational read… Wow.I don’t think this book can be summed up so easily as a good book because it’s deeper than that. It makes you think about how individual all of us are, how big our existence is in other minds. It’s scared me a little if I’m going to be brutally honest, on a psychological level that really shows how politically incorrect our society can be sometimes, if not always. I wholeheartedly believe in the cause of this book, to make awareness of what we know them to be “sociopaths” and now that I’ve read this, I believe that term come with prejudice. I know, I know; this book is a bit out there when it comes to adventurous readers and a teen attached to YA. But, this book has changed me. I feel that Henry Marsh has grasped the ability of writing an educational read and has left the boring monotone scientific books tend to adopt on the shelf. Not to mention he has been able to induce a sense of humanity and morality into his stories that we rarely expect to find in the guy cutting our heads open. No, there is a notion of compassion in his words. His style is somehow relatable which may sound a little odd considering that he’s a brain surgeon (We’re not just talking any brain surgeon either, we’re talking THE brain surgeon, like this guy is legendary) and I am merely an 18 year old student! But yes, this book has made an impact on my life. It has made me more confident and even more willing and a little impatient to get started in the next chapter of my life which involves roaming corridors much alike to what Mr Marsh did in his career. This book made me laugh out loud on the train, snorting into my pages as the commuter sitting opposite raised a curious eyebrow. I gasped out loud in horror and shock as a turned the page on the bus. This book reduced me to tears flowing continuously down my cheeks on the tube; so yes, in case you were wondering I AM THAT GIRL WHO CRIES INTO BOOKS ON PUBLIC TRANSPORT. His accounts on his time spent as a surgeon have opened my eyes and without giving anything away and a risk of spoilers, to those wanting to read it my favorite chapters are “Gliblastoma” and “Medulloblastoma”. To all those interested in medical texts, careers in medicine, or even just for an interesting read; this is your ticket. I thank you Mr Marsh. You ignite the flame of my dream when it fades with your memoir. I think that’s what I love about reading and occasionally writing, is that your story; your words, they never leave. They still have an impact even if you are done writing it. Anyway, back to this mini masterpiece. I can honestly say that her stories have stuck with me. Even now, I find myself thinking about the (MILD SPOILERS) woman who adopted the little girl. I found that story so infinitely sad, I just can’t seem to shake it. And her honesty! Wow, she wrote without fear! Marina Keegan, you have touched me! I can’t thank you enough for your words and being able to relate to you and they way you see the world. “Do you wanna leave soon? No, I want enough time to be in love with everything. Not to mention this little gem (that ended up on my Pinterest, naturally) that opened this memoir. I find it hard to rate this book because it was so diverse! I give a 8andhalf/10 (I WISH THERE WAS MORE). I read this for the first time a couple of years ago, I must have been, what 14? I had heard everyone talking about it and all my older relatives had told me to read it, but I had never given it much thought. Then I picked it up in a “what the hell” phase in the library and read it to kill sometime. When I left the library, I left the book there. The next time I visited the library, I picked up where I left off. This routine continued until I finished the book, tears in my eyes and the feeling I had made and lost a friend. When I look back on it now, I feel quite guilty that I never took the book out of the library, that I never gave it the satisfaction it truly deserved as being one of the books that, I feel has made an impact not just on my life, but lives across the globe. So one day, not too long ago, I bought it at a bookshop, it was going cheap and I thought “what the hell”. About a year after reading this, I visited Germany on a school trip; Frankfurt, where there was a small museum about Anne Frank. If I had not have read her diary, I would have never have enjoyed myself. I’ve noticed I’m constantly thanking the authors, because they deserve all the thanks in the world.